"How much is that puppy in the window?" The cost is incredibly high on the animals who spend their entire lives in squalid conditinos, existing only to experience loneliness and pain while earning their jailers thousands of dollars. When they are no longer able to produce healthy puppies these dogs are often abandoned, or worse cruelly killed by their breeders. Legislation regulating breeders is very lean on the requirements for caring for the animals and facility checks are minimal at best. Further, Backyard Breeders are breeders operating outside the law and animals in these facilities fare even worse. There is no greater cruelty for these poor dogs than being forced to breed and denied any happiness or peace. The cost is doubled when we consider the puppies; these poor innocent pups contribute to the overcrowding problem in shelters. Breeders sell to puppy stores and these pups are abandoned for the same reasons any other dog is abandoned to a shelter... they grew up, divorce, no time to look after them, they got too big, too old... and the list of 'reasons' go on. 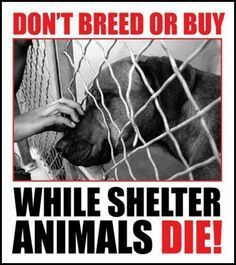 With over 2 million animals euthanized in shelters every year there is absolutely NO reason to breed dogs. The photo is my dear Lexy, taken while she was still in care with the rescue. The state of her belly is shocking. Nearly touching the ground, tender to the touch, and a health risk in so many ways. It took 2 years of physical conditioning and exercise to get her into the shape she is in today. And Lexy's story doesn't even come close to what others suffer at the hands of shady breeders. Please be the answer for dogs like Lexy. Do not support dog breeders and always make adoption your first option. Here are a few ways you can take action. Ask local pet stores to stop selling puppies and support homeless pet adoptions instead. Watch the Humane Societies free webinar: "Banning the Sale of Puppy Mill Dogs at Local Pet Stores." Downloadable their resource guides with ideas to help propel you into action. They can also teach you how to work for the passage of laws in your own community that will improve the lives of dogs in puppy mills. Download "An Advocate's Guide to Stopping Puppy Mills"
Or, you may order the more extensive kit from the Humane Society that includes the guide as well as everything you'll need to start spreading the word about puppy mills in your community, including printed materials, letter templates, tips for developing legislation and activity ideas. The HSUS Puppy Mill Task Force tip line is available to anyone with information on a possible crime involving puppy mills. If you witnessed deplorable conditions in person and wish to file a complaint with The HSUS, please call 1-877-MILL-TIP or report puppy mills online . Contact your federal legislators and let them know that you're concerned about the inhumane treatment of dogs in puppy mills and want the puppy mill issue to be a priority for lawmakers. Ask them to expand the reach of the Animal Welfare Act to include kennels that sell large numbers of puppies directly to the public. See our Adopt Dont Shop page for shelter and rescue statistics showing the gravity of the problem.